Tablets are Great. And not. Tablets are cool. Portable computers are cool. Even non-portable computers can still manage to be cool. 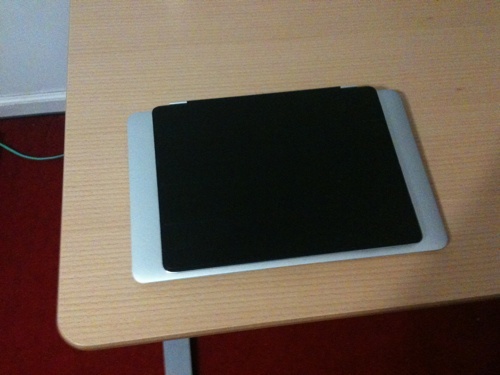 I regularly touch/use/caress at least four computing devices a day and love them all. For typical computing use, however, most tablets have not managed to come close to competing with the productivity of even the least expensive laptop computers. Tablet screens are too small, software isn't straight-up MAC/PC compatible and data entry is either clunky (virtual keyboard), inconvenient (separate input device) or non-private (voice). Certain tablets can do certain things very, very well but replicating the shear utility of a PC isn't one of them. Until Android gets its act together and/or Microsoft gets a somewhat affordable slate/Surface to market, let's focus on the 100-billion-pound gorilla in the room. "100 billion" is the number of dollars of revenue Apple rakes in annually. Last year Apple sold roughly eight iOS devices (tablet computers) for every one Mac (PC). iPads made up about 20% of iOS devices for a total of over 30 million iPads sold -- that's nearly double the number of all Macs sold during the year. Those are fantastic sales numbers for a nonessential device that averages well over $500 per unit. Perhaps consumers consider $500+ a bargain compared to the entry-level $1000+ MacBook sales tag. Before considering price, though, buyers need to remind themselves that the iPad is *not* a tablet version of a MacBook. If you really need to get typical computing things done and those "things" aren't based on iPad-specific software, any MacBook (or any $400+ Windows laptop) is going to run circles around any iOS device. Which device would you rather try to do serious work on? Simply having a bigger display, a physical keyboard and both hands free to type would be enough to give the MacBook a decisive productivity advantage over the iPad. Which would you rather do work on? Factor in usability (try timing yourself on a basic cut-and-paste-text-between-apps operation), software sophistication, storage, processing power and peripherals (a second monitor, perhaps?) and the iPad quickly begins to look more like a novelty device than a serious PC. Other than the small footprint the iPad generally fails to offer any real advantages over a typical notebook. 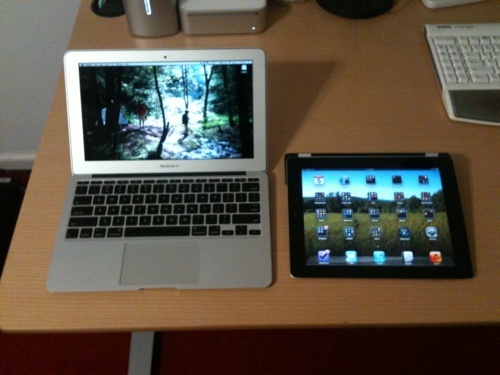 Even the footprint argument pales when compared to the only-slightly-longer 11-inch MacBook Air. There's the iPad's option for built-in 3G cellular connectivity but that's countered by the much faster USB-stick-based LTE options (various sources) that have been around since early 2011. Not as svelte as an internal adapter but a USB stick can be used on more than one device. If that solution feels too ungainly then simply wifi-tether from your 3G/4G smartphone instead of shelling out every month for an extra 3G connection (you do already have a smartphone, right?) NOTE: If you have a pre-ICS Android phone then wifi-tether is not an option unless you root the phone and even then only ad-hoc connections can be made. Instead you'll have to wire up laptop to phone via USB (point awarded to iPad). If you've got a use case that screams "tablet computer" then cheers to the iPad -- it's a wonderful piece of tech and is much sexier than the PADD devices Star Trek fans have been waiting for since 1966. Anyone needing a new computer who is considering a tablet to fill the bill should do a reality check: don't avoid tablet computers but do keep in mind that the iPad and its present-day ilk are still second-fiddle devices to any Mac (or PC) no matter what consultants or sales figures may suggest.